In this power-dominated one-day game, the art of playing with soft hands is frequently overlooked. On this tacky Colombo pitch it was invaluable. Anyone who went hard at the ball soon came unstuck. 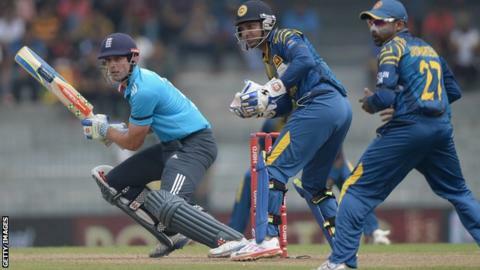 England realised that, but only after they were four wickets down. Sri Lanka reached 100 having lost only two wickets, after which a delighted crowd were treated to a masterclass in how to manoeuvre the ball into a gap from those runmeisters Kumar Sangakkara and Mahela Jayawardene. A required run-rate of 4.13 was never going to seriously tax Sri Lanka, who took an eight-wicket victory and a 2-0 lead in the seven-match series. After last Wednesday's defeat in the first ODI, the England camp talked about the importance of cashing in on the first 10 overs of the innings when the new ball(s) slide pleasantly off the pitch, timing is easier and the field is in. They played in this second match as if they were batting on the same pitch. In terms of the actual strip they were but after the tropical thunderstorms of the last two days and the hot sun that followed it behaved rather differently. It was like batting on drying Plasticine. Sri Lanka anticipated that and opened the bowling with spin from one end. Moeen Ali, still in the assault mode that brought him a brilliant hundred on Wednesday, went up the pitch and tried to launch the off-spin of Tillakaratne Dilshan over the top. He succeeded only in miscuing onto his stumps. Underlining the variety at his disposal, captain Angelo Mathews summoned the left arm spin of Rangana Herath when Ian Bell took guard. Bell tried once unconvincingly to loft Herath over the top - the ball was gripping and turning. He perished trying it again. After one or two decent strokes, Alastair Cook swept at Dilshan who had switched ends, got a top edge and was caught in the deep. England were 37-3. England's best batting came from Joe Root and Ravi Bopara, who played the ball as late as possible, scoring mainly with deft flicks and glides and dextrous use of the wrists. Bopara hit only one boundary in his fifty. Once again he was let down because the lower order found the assortment of Sri Lankan spinners unfathomable. England's total of 185 was woefully inadequate. England still opened with pace - sticking to what they know - and Steven Finn's first over disappeared for 12 to a predictably ambitious Dilshan. As soon as spin was introduced, Dilshan was dismissed trying to clatter a straight six, but all this did was bring together Sangakkara and Jayawardene for an exhibition of how to dissect a bowling attack. Both took their time initially before unveiling their distinct repertoires. Sangakkara was briefly troubled by Moeen's spin away, and generally less fluent, but used the opportunity to groove his batting rhythm. With silky movements and flexible wrists, Jayawardene persuaded the ball into spaces, rarely hitting it in front of the wicket. Even his straight six - the only one of the match - was achieved purely through sumptuous timing. Towards the end the pair looked as if they were having an extended net. Added to their naivety with the bat, England have the added problem of spinners who all turn the ball the same way. This is fine against a team of left-handers but they would undoubtedly benefit from a leg-spinner or a left-armer who could spin the ball away from right-handers as well. It's a minor detail. Ultimately England would benefit from a win but how they are going to achieve that in this series is anyone's guess.